Hey y’all! 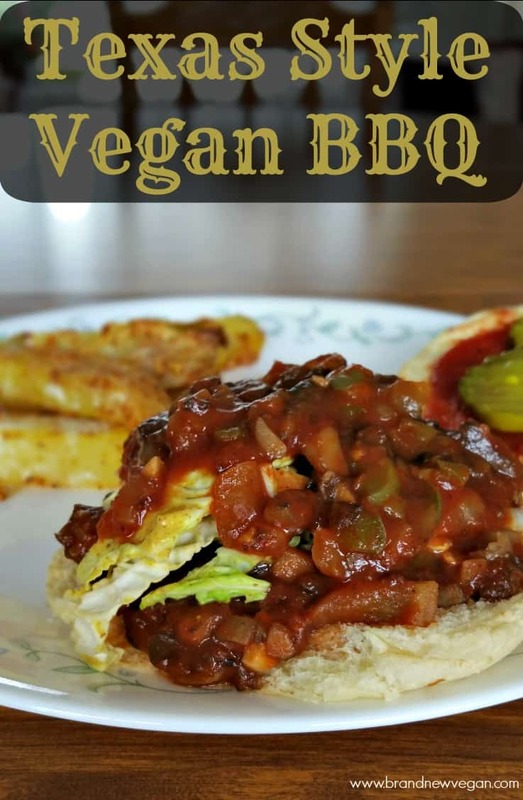 Who’s up for some Texas Style Vegan BBQ? Having lived in a variety of places over the years, I have come to appreciate the unique foods of each and every state I have called home. And in the great state of Texas that meant one thing. Nothing beats an authentic Texas Smokehouse for awesome BBQ. A little corner dive where they serve your food on butcher’s paper and there’s a big roll of paper towels on every table? Yes please! Having lived in the Pacific Northwest for the last 15 years or so, I have missed a good BBQ Sandwich immensely. Until yesterday that is when I opened up the fridge and spied a carton of …. The whole time I’m staring at these Baby Bella Mushrooms, I’m thinking BBQ? Could it really work? Would it be any good? After a good rinsing and draining I chopped the mushrooms up pretty fine with my bench scraper. By the way, if you don’t have one of these amazing little gadgets, you should get one. I use mine a LOT. 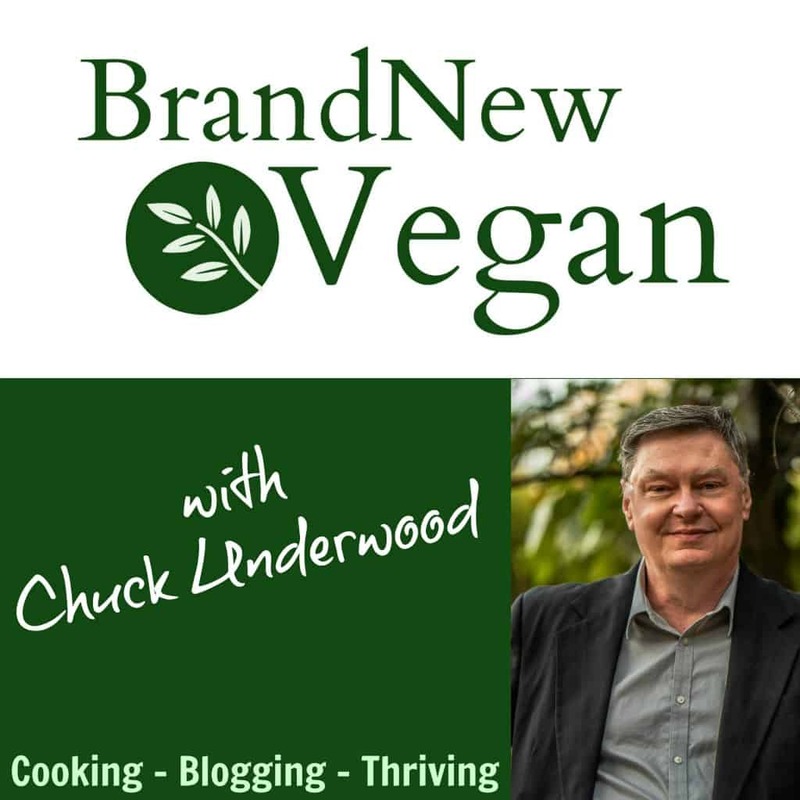 It’s great for chopping mushrooms, green chiles, even garlic. I also use it for making my homemade pizza dough. Real handy little tool. I started by sautéing about 1/2 a white onion and 3-4 cloves of garlic in a few tablespoons of veggie broth. I also added about 1/2 of a chopped green bell pepper and 1/4 of a minced jalapeño. Then in went the mushrooms. Don’t add any more liquid as these mushrooms will release a lot of their own. Just keep simmering and stirring until they get nice and soft. Now we need some sauce. I guess if you’re so inclined, you could add in your own bottled BBQ sauce at this point. Me? I like everything as natural as I can get it, with as few ingredients as I can find. The store-bought stuff is quick and cheap, but it’s so full of other ‘stuff’ I’d rather just make my own. 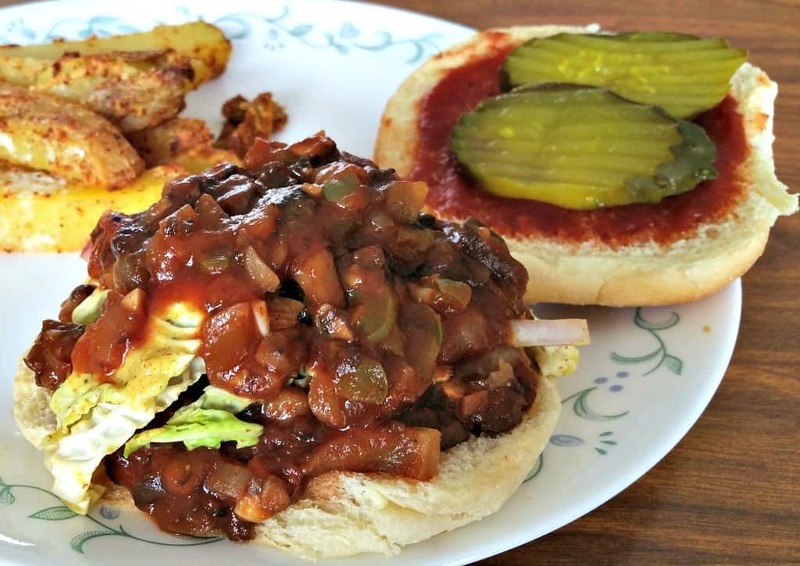 First off I want to say hats off to Ali over at Gimme Some Oven for her amazing BBQ Sauce Recipe. I did have to adapt it a bit based on the ingredients I had on hand, and the fact we’re Vegans and all, but still I want to give her credit. Just mix all the ingredients in a saucepan, bring to a low boil, and then simmer until it thickens. I did substitute A1 Sauce for the Worcestershire Sauce because 1) I didn’t have any, and 2) Worcestershire contains anchovies so technically it’s not vegan. I hear the Amy’s brand sells a Vegan version of Worcestershire, so you could try that, or you can just use A1 Sauce like I did. I also added an additional tablespoon of brown sugar because I like my sauce a bit sweeter. Don’t skip out on the liquid smoke though. This really makes the sauce. When it’s nice and thick go ahead and ladle about 1/2 a cup or so into the mushrooms. NOW it’s starting to look and smell like a BBQ! Cole slaw on top of your pulled pork sandwich is a Carolina thing, I know that. But it is GOOD so I am adding it to my recipe. If you’re not into cole slaw, simply leave it off and chow down on the amazing BBQ you just made. But if you want to add in some healthy greens, and a bit of crunch, let’s keep going. Shred about 1/4 of a cabbage into long strips. I also shredded a carrot too and about 1/2 of a red onion. Add about 1/8 of a teaspoon of celery seed, 2 full tablespoons of Dijon Mustard, and maybe 1/4 cup of Apple Cider Vinegar. Stir that around real good until all the veggies are evenly coated. NOW we’re ready to eat. Spoon some of that amazing BBQ on your favorite bun of choice, add some extra sauce if you like it messy, and top with some slaw. Mmmmmm. Vegan BBQ. It doesn’t get any better than this. And don’t forget the napkins. 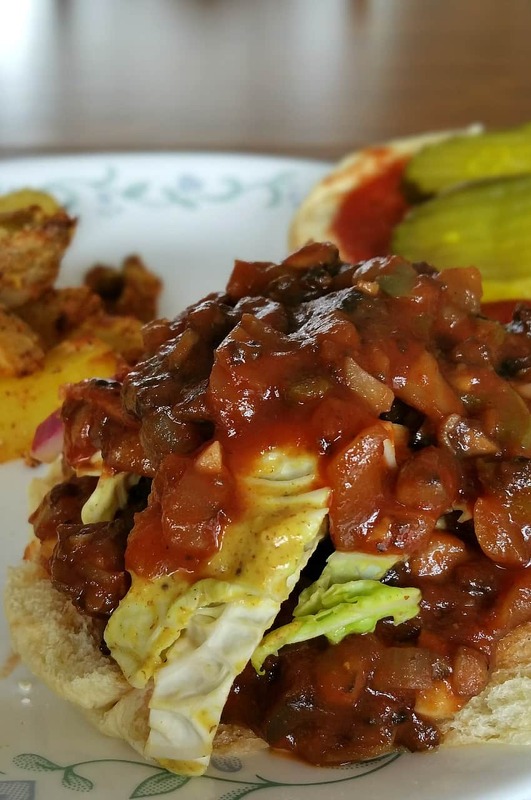 A chopped mushroom BBQ sandwich with an authentic Texas Smokehouse taste. Top it off with some homemade BBQ sauce and a tangy mustard cole slaw and you'll be singing the Cotton Eyed Joe before you know it. Yeeehaw. Yum! Now I know what I’m doing with that last container of fresh mushrooms. Oh this looks so yummy – and with the slaw? Oh, we’ll be making this tomorrow! This was SO delicious! Thanks for the recipe – I am now planning on making this for our 4th of July picnic!!! And I used the Bone Suckin sauce – I love it because it does not have a smoky flavor. So yummy! Thank for the recipe! I made this for the 4th of July. With oven baked smoked shish kebabs (I was using the liquid smoke anyways) It was GREAT! I will be making this for any holiday we want BBQ! Wish I could have posted you a pic, I loaded it on fb! I loved the BBQ sauce – it will be my go to sauce now. Wasn’t that crazy for the mustard slaw but with my sweet-sour slaw, bet I would love it too. I forgot the slice of pickle. (what kind is that?) Oh, I added a bit of soaked soy curls to the mushrooms for my omni daughter and she liked it. Thanks for this great recipe. This is good stuff. I accidentally used the entire green bell pepper (which isn’t my favorite food) and it was still good. I’m thinking I needed to cook my BBQ sauce a bit more to thicken it up, but the flavor was excellent. Just enough spice without being TOO hot. Omg this is what I’ve been craving! Gotta love the internet lol :). Thank you so much for giving me a dinner idea for tomorrow night or maybe tonight ! Looks delicious! 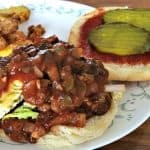 What are the ingredients that make the bbq sauce? Are they not listed in the recipe?